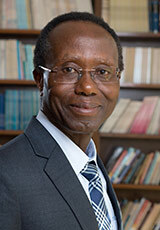 Eben Otuteye is a Professor of Finance with the University of New Brunswick, Fredericton, Canada. Professor Otuteye received a Ph.D. (Finance and Economics) from Queen’s University, Kingston; a M.A in Economics from the University of New Brunswick, Fredericton; and a B.A. in Economics and Statistics from the Univesity of Ghana, Legon. Professor Otuteye joined the Faculty of Business Administration at UNB in 1987 where he teaches in the BBA, MBA, and Interdisciplinary Ph.D programs. He has taught various finance courses, including Principles of Finance, Corporate Finance, Investments, Behavioral Finance, Value Investing, Personal Financial Planning, Theory of Finance, etc. Dr. Otuteye is a world-renowned authority on capital markets and investment decision making, especially value investing. His research interests include behavioral finance; managerial decision making and public policy from a behavioral perspective; value investing, asset pricing models, portfolio management strategies, and the economics and security of digital market, topics on which he has made many conference presentations all over the world and on which he has published in several high-ranking journals. His current research focus is on how investors, managers and policy makers make decisions and how these decisions are reflected in financial markets and other domains. In collaboration with Mohammad Siddiquee, Professor Otuteye developed a heuristic (the O-S heuristic) for making value investing decisions. This is a system for common stock portfolio selection that incorporates the value investing principles as originally propounded by Benjamin Graham and its extensions as developed and practiced especially by Warren Buffett and Charlie Munger. Otuteye, E., & Siddiquee, M. (2015). Overcoming Cognitive Biases: A Heuristic for Making Value Investing Decisions. Journal of Behavioral Finance, 16(2), 140-149. Otuteye, E., & Siddiquee, M. (2015). Avoiding Financially Distressed Companies Using a Value Investing Heuristic. Journal of Investing, 24(3), pp. 73-99. Otuteye, E., & Siddiquee, M. (2013). Examining the Performance of a Value Investing Heuristic: Evidence From The S&P/TSX 60 From 2001-2011. Journal of Business Economics & Finance, 2(4), 67-81. Otuteye, E., & Siddiquee, M. (2018). A Master Class with Warren Buffett and Charlie Munger 2018. South Carolina: CreateSpace Independent Publishing Platform, Fourth edition. Otuteye, E., & Siddiquee, M. (2017). A Master Class with Warren Buffett and Charlie Munger 2016. South Carolina: CreateSpace Independent Publishing Platform, Third edition. Otuteye, E., & Siddiquee, M. (2016). A Master Class with Warren Buffett and Charlie Munger 2015. South Carolina: CreateSpace Independent Publishing Platform, Second edition. Otuteye, E., & Siddiquee, M. (2015). A Master Class with Warren Buffett and Charlie Munger 2014. South Carolina: CreateSpace Independent Publishing Platform, First edition. Otuteye, E., & Siddiquee, M. (2015). Redefining Risk and Return in Common Stock from a Value Investing Perspective: Some Tenable Propositions. Brandes Institute Monograph. Otuteye, E., & Siddiquee, M. (2017, October). Buffett’s Alpha: Further Explanations from Behavioral Value Investing Perspective. Paper presented at the meeting of the Academy of Behavioral Finance and Economics, Los Angeles, CA. Otuteye, E., & Siddiquee, M. (2017, September). Interpreting the Fama-French Five-Factor Model from Benjamin Graham’s Value Investing Perspective. Paper presented at the meeting of the 47th Atlantic Schools of Business Conference, Wolfville, NS. Otuteye, E., & Siddiquee, M. (2017, May). Re-Evaluating the Value of Modern Portfolio Theory and Asset Pricing Models Based on Behavioral Insights from Benjamin Graham’s Value Investing Paradigm. The Administrative Sciences Association of Canada (ASAC) Conference, Montreal, QC. Otuteye, E., & Siddiquee, M. (2017, May). The Case for Scholarship and Education in Value Investing. Finance Area Symposium at the meeting of The Administrative Sciences Association of Canada (ASAC) Conference, Montreal, QC.